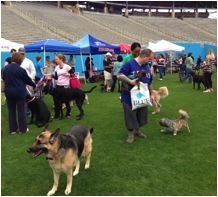 The Dallas-iconic Cotton Bowl Stadium was filled with joy, excitement, paws and hundreds of wagging tails when the Friends of Fair Park hosted their annual Dog Bowl. This free event brought together dog-loving owners with vendors that offered many services for their pets. Today, I had a blast with Avy, my Golden Retriever at the Cotton Bowl. When we arrived both sides of the gates had dozens of owners and their pets waiting for their turn to either walk in, or walk out of the 7th Annual Dog Bowl hosted by the Friends of Fair Park on Sunday, April 7, 2013. I met Hillary Jeffries, one of the excited owners waiting for her turn to let “Rooney”, her schnauzer-mix, run free on the soft green grass of the Cotton Bowl Stadium. “I did not expect to see so many people but I guess I was wrong,” said Jeffries when I asked what she thought of the big crowd. 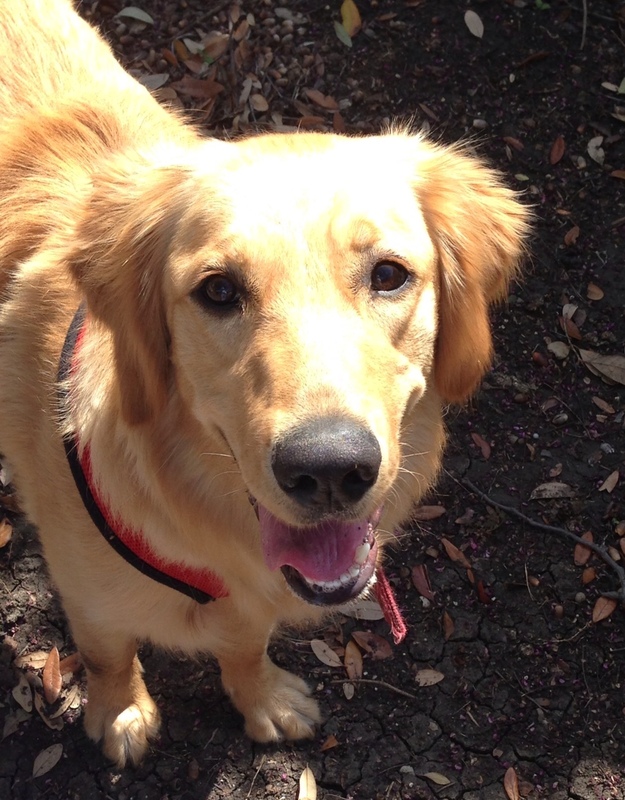 As one gate opened to let the visitors in, one of the staff members, Andrew Stover hurried from side to side, as if playing defense in a football game, making sure no pooch would leave without his owner. Stover has been a volunteer for over three years for Operation Kindness, the largest nonprofit no-kill animal welfare organization for cat and dogs, which was also at the event offering dogs for adoption along with other non-profit shelters. Stover who owns a Labrador and a Chihuahua told me that, “this new double gate system is better than last year, and safer too,” when it was easier for dogs to leave with the crowd without anyone noticing; Although, no dog was permanently lost. She was probably referring to the 1000 dogs or so that attended the event and most of them were running and playing around without a leash. Dogs of all sizes, fur type, and color splashed in the sip and dip pools, played fetch with freesbies, or walked around the vendor tents with their owners. 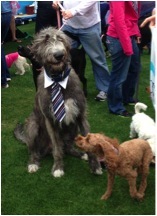 Some dogs however, attracted more attention than others for being one of a kind in that sea of wagging tails. One of them was “Giacomo,” an Irish Wolf Hound whose owners Derek Mills and Lindsey Redfern named after Giacomo Agostini, an Italian world champion motorcycle road racer. “Giacomo’s” size was colossal next to his adoptive sister “Desmocedici” a Spaniel-mix named after a motorcycle series. 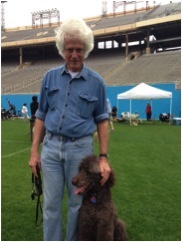 Another one-of-a-kind dog was “Prince Harry of Turtle Creek” a standard gray poodle also known as “Harry.” Harry’s owner is Craig Holcomb, the President of the Friends at Fair Park organization and the founder of the Dog Bowl. The last activity of the event, and the most awaited for was the “look- alike contest,” where about a dozen contestants posed next to their dogs to win the coveted first place. After much deliverance from the judges, James Olivas who wore a matching chopper vest and sunglasses with his dog “Jasper,” won first place. At the end of the contest, most of the attendees began to leave to the rhythm of the local jazz favorite Barri Pearson, and with wagging tails the dogs expressed how much fun they had at the event. 07 Apr	This entry was published on April 7, 2013 at 2:50 am. It’s filed under curiosities, Nature and tagged bowl, cotton, d, dallas, dogs, golden, irish, l, motorcycle, retriever, s, shepard, texas. Bookmark the permalink. Follow any comments here with the RSS feed for this post.